« 5 things to like about the Red Sox & this season, part 1. Here’s a great quick read by a man who conjured smiles. Working The Plate by Eric Gregg with Marty Appel. 1990, Morrow. Almost any Umpire autobiography is likely to be interesting. They have much in common with the ballplayers. Travel. Teammates. The uncanny ability to block out distraction. And they have daily exposure to rookies, journeymen, superstars, and — major league managers. There is plenty of inside stuff to share, and Mr. Gregg does it well. Even better, this is Gregg’s story of success. Gregg made it to the top in spite of growing up in a West Philly family that lost 2 children to drugs and street crime, and a third who became a career criminal. Now how could a guy as sweet as the 350 pound Gregg come from a dysfunctional cauldron like that? Gregg had charisma, my friends. Gregg was magnetic. He charmed and scuffled his way into Barney Dreary’s Florida umpire school as a kid. He moved through the minors in record time and began his MLB run at age 24. His personality brought him more than his share of commercials and PR jobs. Gregg was a winner. His on field resume of historic games including the first night game at Wrigley, 2 Perfectos, the 1986 All Star Game., the historic Reds-Mets brawl of the same year, and the 1989 World Series Earthquake game. I would add that the American League’s failure to ink African Americans in the ‘50’s helped (at least in part) to make the National League the superior circuit in 18 of 19 All Star Games between ’63 and ’82. In another favorite part of Mr. Gregg’s book he described Jose Canseco as a big guy, and so talented that he would likely dominate the next decade. Might have happened had Jose’s muscles been as natural as Gregg’s girth. Never intending to leave the Game, Gregg voluntarily resigned in ’99. 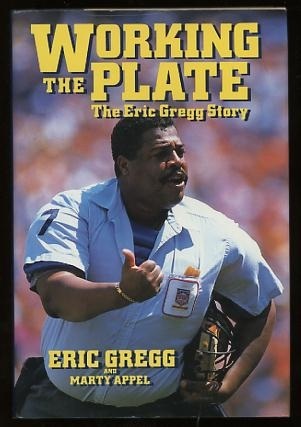 At the behest of his union, Gregg was one of 22 Umps that tendered their resignations to leverage a negotiation and were shocked when the MLB accepted. That occurred 9 years after Working The Plate was published. Clearly, Eric Gregg loved the Game, was part of the Game, and could never really leave the Game. Bud Selig refused to rehire Gregg even after 25 Members of Congress requested his reinstatement. That says something about MLB’s resolve to drop the unhealthy big man, whose weight approached 400 pounds frequently. Oh yes, this book captures the moment when he umpired 3rd base and a hero sandwich had been anonymously left atop that sack for him. And then there was the time that a player entertained the crowd at one of Eric’s games by stuffing pillows into his uniform and making out and safe calls at second base. Many fans will chuckle at the mention of Eric Gregg. They are thinking of the big, fat guy who somehow umpired in the bigs for 22 seasons. As is usually the case, if you know the man at all you have more respect than that. He was a talented Umpire and a devoted family man. He did not undervalue all the good things that life brought to him. Mr. Gregg passed at age 55 after a stroke in 2006. He left behind a wife and 4 children. Rest in Peace, Eric Gregg. Thanks for representing Philly and adding some cheer to the Game. Go Sox. And Happy Jackie Robinson Day to you. This entry was posted on April 16, 2014 at 12:04 am	and is filed under BASEBALL BOOKS. You can follow any responses to this entry through the RSS 2.0 feed. You can leave a response, or trackback from your own site.